I woke up at 6:00 a.m. today morning when my husband was still asleep. I wanted to surprise him with nice breakfast in bed, so I baked him these delicious muffins. 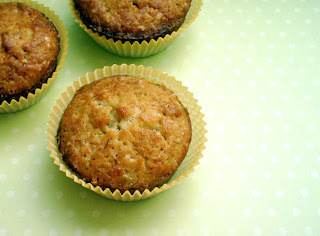 Personally, I never eat muffins that early in the morning, but my Canadian husband is much more used to having sweet breakfasts than me, so banana muffins made perfect breakfast for him. The recipe I used was actually a recipe for banana bread, but I got a wonderful muffin pan for Christmas and really couldn't wait to try it. So I decided to turn the bread recipe into muffins. The bread was originally made with lots of nuts and cranberries, but I wanted my muffins plain, so I omitted them completely. I also reduced the amounts of oil and sugar. The result was wonderful!!! My husband said they were the best muffins he had ever had in his life! I tried some later in the afternoon and I have to admit they’re really really delicious, extremely moist and very aromatic!!! Their wonderful warm banana and orange smell fills the entire house. 1. Preheat oven to 180 C (350 F). Line a muffin pan with paper baking cups, you'll need ten of them. 2. Sift flour and baking powder into a large bowl. Add brown sugar and orange peel. Mix well. Fold in mashed bananas. 3. In a separate bowl, combine wet ingredients. Mix well. 4. Add wet ingredients to dry ingredients and stir until just mixed and moistened. Do not over mix. 5. Fill each muffin cup to 3/4 full. 6. Bake 30 minutes or until golden brown. 7. Cool 5 min. and then remove from pans. I think you add the wrong quantity of baking powder. I think you should at least double the q'ty. Perfect! I never seem to have much luck with banana and/or muffin recipes, but these turned out very well. I made them with brown flour and I only had 1 banana but they were SO delicious. Am going to make a big batch for our upcoming party. Thanks so much.